A government-sponsored memorial ceremony was held in Tokyo on the 7th anniversary of the March 11 disaster. Sunday's ceremony was attended by Prince Akishino and Princess Kiko, Prime Minister Shinzo Abe and relatives of the victims. A moment of silence was observed at 2:46 PM, the exact time when the massive quake hit. Abe said the reconstruction is progressing step by step, and the government will provide seamless support to accelerate the process. 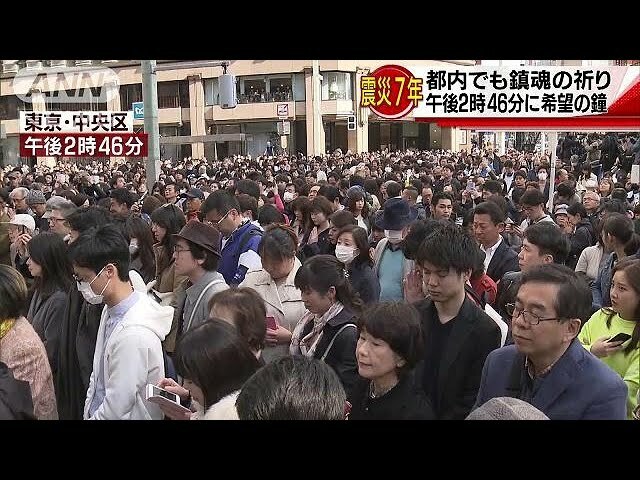 He said the government will speed up the rebuilding of infrastructure in the areas affected by the nuclear accident to allow the residents to return. Prince Akishino said his heart is with the people who are working for the reconstruction, despite continuing difficulties, and he hopes that they will be able to live in peace and good health as soon as possible. Kazumoto Isozaki, who lost his mother in Kamaishi City, Iwate Prefecture, where she was living alone, said he remembers her happy smile on her 90th birthday, and he will never forget that day. Hidetoshi Onodera, from Miyagi Prefecture, said his father's body was found under the rubble the day after the disaster, and his daughter found his mother's body. He said his daughter got married after the disaster and now has two children, a girl and a boy, and they are like reincarnations of his parents. Hideko Igarashi, from Fukushima Prefecture, said she is full of remorse for not urging her husband to escape before the tsunami hit, and she will continue to tell people to protect their own lives and escape when they need to.